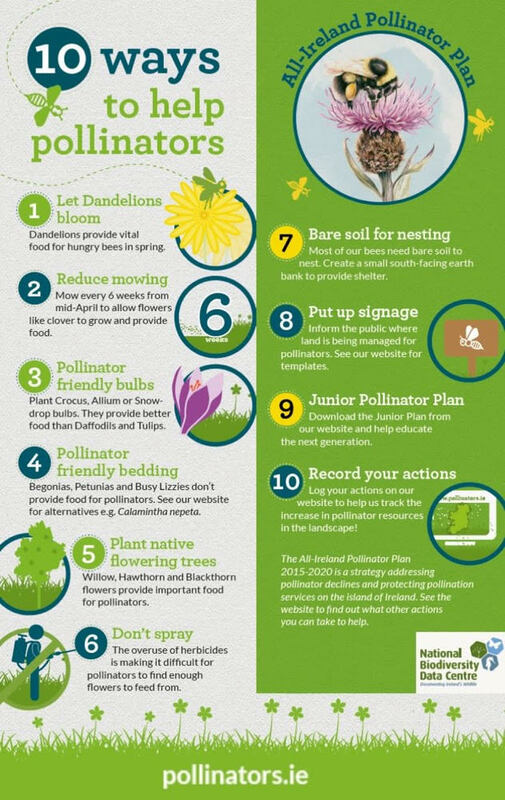 As a supporter of the Pollinator Plan we are playing a vital role in helping pollinators to survive and improve biodiversity across Ireland. As our town is a centre for business as well as residents it’s vital to help raise awareness and understanding in how we can all play a necessary part role in this. Follow us on Facebook for tips on how you can get involved, what a pollinator friendly garden looks like and getting the children involved. Keep an eye out for our Bug Hotel, Bird Boxes, Bat Boxes and Bee Boxes to name a few.. Why not get involved too and post pictures to our facebook page.